Opening hours: Monday to Sunday from 12:30pm to 6pm. Important info: Please note that in peak times and on weekends, customers may have a small wait for the next available timeslot.In order to gain entry you must present a printed copy of your voucher. 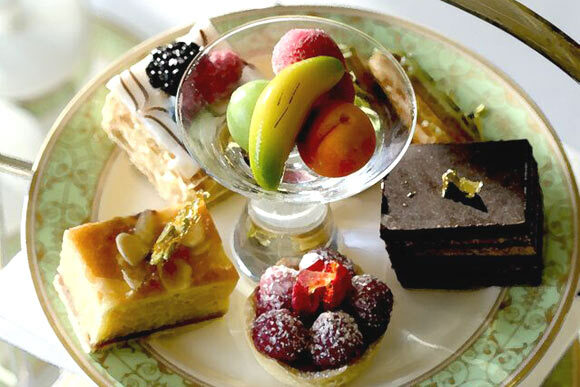 Tantalise your taste buds with savoury and sweet treats by sampling the much loved Anna's Champagne Afternoon Tea menu at Grosvenor House. Perfectly situated overlooking Hyde Park, the quintessential stately home provides an elegant and relaxing atmosphere for an enjoyable afternoon. Choose from a delicious assortment of delicate sandwiches, indulgent cakes and pastries, and scrumptious freshly baked scones. The Champagne Afternoon Tea is named after 'Anna', who is understood to be responsible for starting the custom of Afternoon Tea. It can be traced back to the early 1800s, when it is said that dining late in the evening would leave Anna feeling peckish in the afternoon. Looking to overcome her afternoon hunger, Anna would order tea, bread and cakes to her room. The idea of tea and a snack in the afternoon developed into somewhat of a ritual, and the much loved English tradition of Afternoon Tea was born. Traditionally, 'low' and 'high' tea referred to the height of the table the tea was served at. High tea was served at dinner tables, whilst low tea was served on low coffee tables. Around 165 million cups of tea are drunk in the UK every day!